We are dedicated to crafting the most innovative, high-quality value-added products on the market, backed up by unmatched customer service. We believe that putting the customers’ needs above all else will help ensure a bright future for our foodservice partners, our business, and most importantly, our employees and stakeholders. 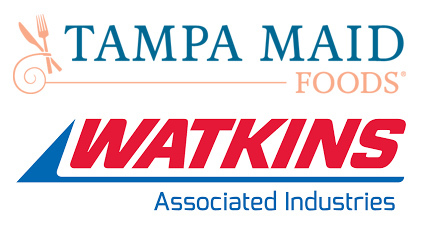 In 1974 Watkins Associated Industries purchased Tampa Maid Sea Products, a small shrimp packer based in Tampa, Florida. At the time, the company processed about 10,000 pounds weekly of various commodity and value-added shrimp and seafood products. Procuring domestic raw shrimp along the Gulf Coast through company-owned waterfront facilities from Key West to Brownsville, Texas, Tampa Maid flourished and expanded the Tampa processing facility several times. In 1987 Tampa Maid purchased a seafood specialty company, Bayou Foods, from General Mills and brought the renowned Cap’n Joe brand of crab specialty items to the product lineup. Tampa Maid purchased a competitor, Bee Gee Shrimp, in 1997 and moved operations from Tampa to the acquired company’s processing facility in Lakeland, Florida. In 2006, Tampa Maid continued its growth by acquiring Cox’s Wholesale Seafood in Tampa. As a wholly owned subsidiary of Tampa Maid, Cox’s is the premier supplier of domestic wild-caught Key West pink shrimp to the retail and foodservice markets. Working together, the two companies provide a variety of both imported as well as domestically produced seafood products for their customers. In 2008, Tampa Maid became the exclusive licensee for Margaritaville® brand seafood, which we source, process and market to retail groceries and club stores nationwide. In 2012, Tampa Maid expanded our product portfolio and launched Harvest Creations®, our signature brand of farm-fresh breaded vegetables that utilizes our years of experience in coating quality food products. Today, we are still owned by Watkins Associated Industries, a family-owned, U.S. company. WAI is a highly successful business composed of trucking, food processing, building materials and real estate development. This privately held corporation is in its third generation of Watkins family management. Our family management creates a special culture throughout the organization and instills a sense of pride in our employees that shows through in the products and services we provide for our customers. Tampa Maid Foods is in the business of sourcing, processing and marketing high-quality value-added food products from around the world to the foodservice and retail markets. Tampa Maid’s primary expertise is in coated products. We have world-class product development, as well as processing capabilities to coat seafood and farm-fresh products utilizing the full spectrum of available coating formulas. From breadcrumbs and cracker meals to flours and batters, as well as flavor-infused glazes, Tampa Maid specializes in making products that taste great and are easy to prepare. Our U.S.-based, state-of-the-art facility is dedicated to processing, product development and storage. We subscribe to several inspection services such as the AIB. (American Institute of Baking) and BRC (British Retail Consortium), which help ensure our adherence to high standards of good manufacturing practices, sanitation and overall food safety. We source both commodity and value-added seafood products from our supplier partners worldwide. We require our suppliers to meet the same stringent standards for food quality and product safety that we have set for our own manufacturing facilities. In addition to our specifications, standards and inspections, these supplier facilities must also meet the requirements of recognized third-party food-safety audits. The health of our oceans is of great importance to Tampa Maid. Ocean Trust is recognized as a premier organization for understanding, maintaining and restoring the world’s fisheries. As a strong supporter of Ocean Trust, we are working to better understand the status of our source fisheries and ways to ensure the protection and sustainability of the ocean-caught and aquaculture seafood we process and market to the industry. Sustainability of our food supply requires the preservation of natural resources of wild-caught species, and ensuring that aquaculture can indefinitely continue production without harm to the environment and its ecosystems. Tampa Maid has partnered with suppliers and organizations with these same concerns and goals in mind. Tampa Maid has over 40 years commitment to food safety, quality and service. The programs we have in place ensure that all of our products are processed with highest standards for quality and food safety in mind. All of our products are made with wholesome, quality ingredients. All plants are HACCP approved. Tampa Maid’s U. S. plant has several third-party food-safety audits annually and is certified by the BRC (British Retail Consortium) a premier worldwide food safety organization. In addition, our plant is under the inspection services of the U.S.D.C. (United States Department of Commerce). All foreign plants are third-party audited and many are BRC and BAP certified. Tampa Maid monitors all daily foreign & U.S. production QA reports on sanitation, GMPs, microbiological & drug testing, raw material and finished goods. All finished goods and raw materials have full traceability. Sustainability of our food supply requires the preservation of natural resources of wild-caught species, and ensuring that aquaculture can indefinitely continue production without harm to the environment and its ecosystems. Tampa Maid is committed to a sustainable future. We practice the following to ensure our products are a part of the sustainable story. Recycle all corrugated and paper goods—In 4 years, over 1,700 tons were recycled, saving an additional 30,124 trees. Reduced packaging to reduce waste — In 4 years over 58 tons of bleached cardboard was eliminated, saving an additional 994 trees and preventing bleaching chemicals from entering water sources. The only corrugated cardboard used by Tampa Maid is in unbleached, recyclable shippers, reducing chemical use and protecting water sources. Run a state-of-the-art thawing system to lower the demand for water and sewage capacity by 100,000 gallons/day. Use energy-efficient air handlers in the freezers. Energy-efficient lighting throughout facility—Annually saves about 96 tons of coal and reduces carbon dioxide emissions by about 404 pounds per year. Waste from manufacturing is converted to animal feeds. Used frying oil is recycled into other products. Pre-treat all wastewater returned to the city, reducing biological oxygen demand and total suspended solids. An improved water treatment system has further reduced suspended solids by 80%. Broken wood pallets are rendered into mulch. What has Tampa Maid done? Tampa Maid Foods is proud to partner with the Global Sustainable Seafood Initiative (GSSI). GSSI provides a one-stop-shop for credible seafood sustainability certifications. GSSI’s Global Benchmark Tool provides clarity on, and transparency in, seafood certification by recognizing robust and credible certification schemes (local and global) that meet the United Nations Food and Agriculture Organizations’ (FAO) Code of Conduct for Responsible Fisheries (CCRF) and FAO Ecolabelling Guidelines. By having more choice in seafood certification, processors are able to diversify their sourcing; thus, improving the needed supply to meet an increasing demand for certified seafood from the market. Tampa Maid procures all of its popcorn-style shrimp from two countries that practice conservation by shutting down their fisheries each year at the appropriate time for fishery renewal. Tampa Maid procures a large and growing portion of its raw material, breaded shrimp material and other products from BAP (Best Aquaculture Practices)-certified facilities. We are committed to purchasing all of our aquaculture needs from BAP-certified sources as soon as possible. Palm oil used in our Margaritaville glazed shrimp is sourced from a company that is committed to sustainable palm oil production and fully supports the Roundtable on Sustainable Palm Oil (RSPO). Tampa Maid supports Ocean Trust, which is one of the few organizations that actually performs the necessary tasks of habitat restoration and marine conservation with the funds it receives. Tampa Maid is a member of the National Fisheries Institute and has supported the Institute’s efforts to aid in marine conservation, as it partners with Ocean Trust and other initiatives. Traceability is becoming a critical part of sustainability. All seafood ingredients and product-contact packaging can be traced one-up/one-down. Oysters can be traced to state and harvest area. Chef Mike is our corporate chef and manager of Culinary Services. He is responsible for the development and administration of all culinary functions at Tampa Maid as they relate to recipes, new product ideation and applications, product training and presentations of Tampa Maid’s products in the marketplace. Earning numerous awards in both academic and culinary competitions, he graduated valedictorian of the prestigious Cordon Bleu program at the Orlando Culinary Academy. Placing his initial emphasis on fine dining, he joined the professional culinary teams of two of the country’s finest five-star restaurants, Blackberry Farm and Disney’s Victoria & Albert’s. Advancing to the business aspect of the culinary arts, he then served as the corporate recipe development chef for Publix Super Markets from 2006 until 2013 when he was welcomed to Tampa Maid Foods. Chef Mike has worked with many of the world’s most talented culinary professionals, has been a featured chef at the South Beach Food & Wine Festival, and presented innovative culinary concepts to guests at Disney’s EPCOT Food & Wine Festival for five consecutive years. A relentless student of food in all its presentations, Mike takes every opportunity to explore the fascinating history, chemistry, culture and art of beautiful cooking.